The project does not require a high degree of commitment from the local administration, other than a minimum degree of maintenance, nor does it incur high costs. The town hall simply has to assign an unused though accessible green public area or part of a garden. As a community inspired project, there is no need to mobilize an entire department, and just a few clear rules are enough to get started. See below section "directions and requirements" or click on the left-side menu. The purpose of this website is to provide guidance on how to start up the project with a easy to follow methodology and a simple set of solutions so as to minimize preparation and coordination time and thus allow local councils to focus on the few operational aspects. This initiative provides many noted benefits to all those involved. - An increase in the arboreal heritage of the community with little expense. - A reduction in climate change impacts (CO2, temperature, and so on). - A contribution to sustainable development programmes (Agenda 21, Kyoto Protocol, and so on). - Creation of a new form of urban or peri-urban landscape. - Availability of a public green space in which to get directly involved. - Direct and indirect improvement of citizens’ welfare. - Identification of a place of belonging and sharing. - Strong educational value for individuals and families. - Creation of a public space that would bring together citizens of all ages. - Promotion of active citizenship through a project that is easy to understand. - Low investment cost of the initiative as labour and trees are provided by the citizens. - An improvement in the image of the administration. - Minimal time, resources and financial commitment. It must be a public area belonging to the local council intended for use as an urban garden, agricultural or forested land and not subject to constraints. 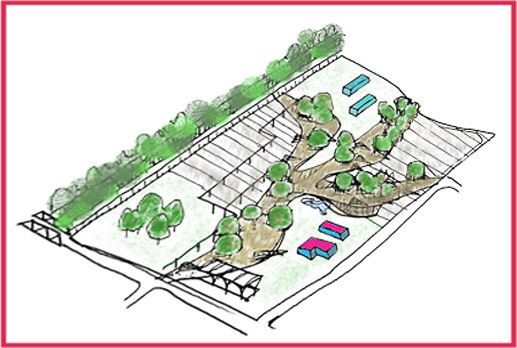 It may be a part of a pre-existing city park, a public garden, or a grassy river embankment. Deciding on an appropriate dimension will vary depending on the size of the community and the availability of land. Ideally, an estimate of the number of people supporting the initiative (citizens, schools, associations, businesses) would be useful in order to correctly estimate the area of green space required for the project. It is important to also take into account the extra space needed by the tree to grow. Tall trees will need an area of around 5–6 m (about 10 feet) in diameter, depending on the species, while other plants will require around 3 m (5 feet) in diameter. The area should be covered by fertile and pollution-free soil with good drainage capacity. It doesn’t need to be grassy and could be partially covered with vegetation and some trees. The surface does not necessarily have to be flat, but it has to be easily accessible. The local council can decide on the shape and appearance of the site depending on their needs and availability, as well as those of the community, while respecting the natural site and local species. If considered necessary, and in order to prevent unauthorized access and facilitate entry, the assigned area could be fenced such that access is limited to agreed times and periods in the year. This decision could be motivated by the need to prevent vandalism or anti-social behaviour. As a general rule, local plants should be used, especially those that are less common or those that deserve to be known and appreciated. Exotic plants or plants that do not thrive under the local conditions or landscape should be avoided. For the benefit of citizens, the local council should make available a list of suitable species, which would also provide useful information on the local biodiversity. The local council could also narrow the list to a predefined number of species, or even one (thus creating a forest), although the latter situation denies citizens of a choice according to their preferences. A few, simple rules, should be in place from the outset. In addition to ensuring a healthy distance between trees (described above), the earth should be dug around the tree and covered with good quality fertile soil with a drainage layer of gravel or crushed stone. Trampling the soil around the plant will ensure that the plant is secure, and fastening to a stake will further increase anchorage (if required). The tree should be abundantly watered. It is important to note that some plant species are associated with species similar to them, while others coexist very well with different species. Depending on the available surface area, it may be judicious to calculate the number of trees that can be planted, taking into consideration that taller trees need a distance of about 3 metres (10 feet) from other trees, while an average sized tree requires just 1.5 metres (5 feet). With the layout map of the area and using a pair of compasses or similar drawing instrument to demarcate plots, calculate tree space by allotting a radius of 3 m (in scale) for tall trees, and 1.5 m for others. This simple task helps define the ideal number of trees and where they should be placed, which manages the space and thus prevents organizational issues later on. The division into plots will prove useful to citizens too, as they will know exactly where to plant their tree. Moreover, signage can identify areas reserved for planting. As regards the number of trees to be planted, the local council should define the maximum number of trees that can be planted in the space available in order to meet the demands of citizens and, and in the event of over-subscription, find ways and means to extended the plots or make available an additional site. As we said before the best time to plant a tree is the vegetative rest period (which differs from one species to another, but generally goes from September to March for plants with leaves, and October to April for evergreens). Knowing that and depending on the region’s climate, the municipality can choose one or more specific days. Each municipality have to make its own assessments based on the preferences of the stakeholders (citizens, schools, clubs, etc...) to organize admission times to this site, which in the end belongs to the community. For logistic reasons, and due to the fact that the land could be fenced, you can choose a favorable schedule for everyone. For management and organizational reasons, some municipalities may record donors, which would be useful to advertise the "gift-act", but also, more practically, to avoid setting up disputes or problems which might occur later on. The register could contain the names and surnames of people who appreciate public registration, while for those who prefer to stay anonymous an abbreviation or a code could be used. Moreover, by including the date of planting and tree species, the register would provide an inventory of plants and their age. Each municipality can choose whether and how to disclose the register, e.g. in the citizens tree garden, the city hall and so on. It is also possible to register the trees donated on the website of the UNEP Environment Program United Nations campaign on "The billion tree campaign”, which is explained on this: link. The municipality may choose to make available to the citizens tools such as blades (to dig and make holes), watering cans, fertile soil, gravel, ropes (to secure the plants to tree-stakes), or explicitly request that everyone brings such tools, indicating it clearly. And just in case, it is good to keep a fair stock of what above mentioned, for those who would eventually forget to bring such materials, or would bring in not an appropriate or sufficient way. Once the trees have been planted, during their growth, little maintenance might be required (to be established in a defined number of hours per year) for the area/garden, as it is for any communal garden. The days of maintenance can be fixed and communicated to the citizens, who might like to attend or participate in the operations, if allowed. Citizens should be informed of the maintenance days (established in advance) in case they wish to participate, whenever it’s possible. In addition to the normal rules of civility, and respect for other people's trees, some “to-do” and some “not- to-do things” can be defined. For example, individuals should not use products to combat pests, or bring harmful chemicals or dangerous substances. Inappropriate behavior (such as playing football, fires etc.) should be banned; it should be more or less like in a botanical garden.To avoid unpleasant situations dogs and other animals shouldn’t be allowed (if not on a leash), at least during the period of trees growth. It would be good to have a bulletin board at the entrance of the area explaining the project, rules of conduct and timetables. The board could also show a map of the garden with its subdivisions and, eventually the Register of Donors (of course with their consent). The logo designed for this project can be used, previous authorization from gift-a-tree. As in any public area, litter bins should be disposed proportionally to the size of the place. It is a little thing often overlooked, but very useful to keep the area tidy and clean. Educational institutions might be actively interested in the project. With their help, environmental courses focusing on trees and ecology could be prepared. Outdoors activities can be arranged to plant a tree or just to visit. ENVIRONMENTAL, PHILANTHROPIC, NEIGHBORHOOD ASSOCIATIONS, ETC. The different associations of a municipality can obviously be involved in the project. First of all the environmental associations that can provide a specific knowledge and support, but also associations of all types and levels that are consistent with the values and intent of the project. Clearly concerned for business reasons (but not only), nurseries can help in the development of the project, for instance with discounts during the planting period, or advertising the project in their shops, or even becoming sponsors. Any other entity, such as patrons, foundations, companies wishing to actively contribute to the success of the initiative, can obviously be involved, according to the requirements of each administration. If thought relevant each municipality can choose among different ways of encouragement, as financial contributions, agreements with garden nurseries (e.g. special prices for the trees), or offering gadgets like wood guardians or bags in eco canvas. To give recognition to the project it is important to use adequate means of communication and information. As already mentioned, the gift-a-tree logo (click on the word to see it) can be used to promote the project. Newspapers and local TV networks will find it interesting to draw attention on the “gift- a-tree garden” project (or whatever other name) as it is easy to understand and of an immediate communicational impact. With all the environmental and public benefits, the project is worth to be highlighted. Also, a printed paper with the main ideas and goals of the initiative should be submitted to the press. The website gift-a-tree.net can also be used as a reference. - send specific notifications to mailing lists. Nothing takes from organizing side events or actions to support the initiative, according to the environmental principles which inspire the gift-a-tree initiative.